Abstract: Boathouses have been in use in Norway for at least 2000 years and c. 850 structures pre-dating the 16th century have been recorded. The majority of boathouse remains (at least 500 structures) are found in northern Norway. The limited extent of boathouse excavations to date has severely handicapped attempts at interpreting the function and chronology of these structures. This paper explores the nature of boathouse use during the Iron Age up to the early Middle Ages (c. AD 300-1200) in northern Norway by focusing on archaeological investigations of boathouses on the island of Vestvågøy and the Iron Age chieftain centre at Borg in the Lofoten Islands. Archaeological evidence from recent test excavations at a number of large boathouses, including multiple cultural layers with hearths and pit features, is suggestive of seasonal habitation and a range of activities far more diverse than those traditionally associated with the storage of boats and related equipment. Radiocarbon dates demonstrate that some boathouses were in use over many centuries thus adding another element of complexity to our understanding of boathouses as multifunctional components of the Iron Age maritime landscape. Introduction: The maritime aspects of Norse culture and “Vikings” presented by the media and in popular publications focus to a disproportionate extent on the role of Viking Age ships engaged in warfare, raiding and, to a lesser extent, trade. This image is based in large part on evidence from a limited number of ship finds including the spectacular Norwegian ship burials of Oseberg, Gokstad and Tune and the Skudelev and Roskilde ships in Denmark. The history of Iron Age archaeological research in Norway provides us with a somewhat different perspective. Up until the 1930s the focus was almost exclusively on graves, with the addition of longhouses as objects of interest during the 1930s e.g. Grieg. In northern Norway, longhouse excavations did not begin until the 1960s Johansen. The excavation of longhouses and graves has produced a limited number of finds that provide information on maritime activity such as fishing from both an economic and ideological perspective e.g. Helberg, Jørgensen, Stamsø Munch. 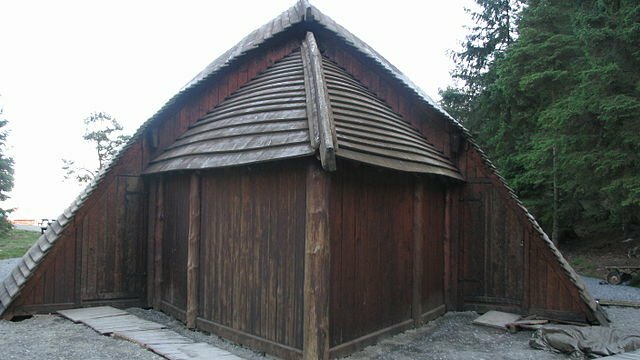 Apart from boat remains, boathouses are the most important source of information on maritime aspects of Iron Age society. Despite their potential, archaeological investigations of boathouses are still frustratingly limited in quantity and scope. Our main purpose in this paper is to highlight the research potential of prehistoric boathouses for exploring not only maritime issues but also more general questions concerning their role as material expressions of social practice.